Where there was once delineation between banking processes that a consumer could do from the comfort of their home or with the convenience of a smartphone and those that were done in a branch office, the use of digital functionality has finally become universal. No place is this more apparent than with the new account opening process, where features such as the camera phone OCR have improved both the mobile and branch account opening experience. With 70% of likely checking account applicants saying they would prefer to submit a digital application in 2015, it is clear that using digital functionality to improve the online, mobile and even the branch account opening process will eventually improve the onboarding and engagement process for new customers. Surprisingly, most banks have not responded to this revolution in digital functionality. From hard-to-read screens to requiring signature cards and proof of identity at a branch, the process must improve. Even more surprising, while most banks offer online account opening, less than 20% offer a truly mobile new account opening process. 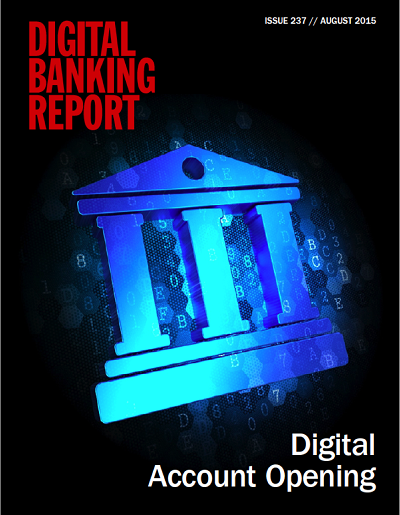 The 57-page Digital Banking Report, Digital Account Opening, focuses on the digital account opening (DAO) experience for checking accounts, and the landscape of solutions and workflows that comprise the end-to end account opening process. We focus primarily on account applications from new checking customers and include both self-service solutions as well as branch-assisted processes. This report will help banks and credit unions move forward with digital improvements to the account opening process, removing friction, simplifying processes and providing a seamless digital experience. A users guide to improving the digital account opening at any financial institution, including case studies and list of solution providers.